Ilon's Wonderland: "I Am Always Here.Ilon"
Ilon Wikland is one of the most well-known Estonians in the world and certainly, she is the most famous Estonian related to Haapsalu, as she has illustrated most books of world famous children’s author Astrid Lindgren. Ilon Wikland spent her childhood in Haapsalu and from here she escaped the war, reaching Sweden at the age of 14. While creating illustrations to Astrid Lindgren’s books, Ilon often subconsciously used the ruins of Haapsalu medieval castle, small and cosy wooden houses and sea as a source of inspiration. 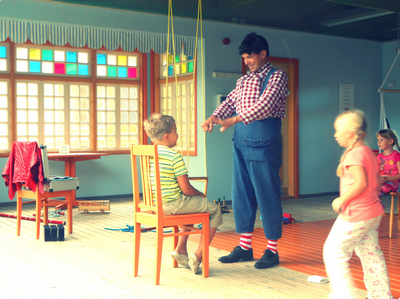 In 1989, 2 years before regaining independence in Estonia, Ilon Wikland brought Astrid Lindgren to see her childhood town. An idea started to develop slow and steady. In 2004 Ilon Wikland decided to give more than 800 works to Haapsalu – her childhood hometown. The gallery was opened in 2006. An idea came forth to establish a centre, which would offer activity and playroom for children. Ilon’s Wonderland theme centre was opened in 2009 with a big house with gallery, cinema hall, a Bullerby-style kitchen, Karlsson’s cubby and playroom, a spacious play yard and handicraft cottages. A need to refurbish and evolve the gallery led to cooperation with Tea Tammelaan, who curated and designed a new permanent exhibition with the title „I am always here. Ilon”. The exhibition was opened in January 2014 and was awarded the Museum Rat Award for the best permanent exhibition in 2014 in Estonia. Besides more than 200 Ilon Wikland’s original drawings it also exhibits her miniature plastic art pieces, photos, books, mementos and other materials about Ilon’s life, journeys and work. Everything is wheelchair-accessible and the pictures are also visible at child-height. The exhibition texts are in six languages. One can also see books drawn by Ilon and draw a picture on the wall in gallery being inspired by her work. While the new exhibition aims to introduce Ilon Wikland’s work, biography and the birth of a book, theme centre aims to bring the visitor into the beautiful, safe and creative environment, where he or she has already been, reading Bullerby stories, Mardie, Karlsson, Brothers of Lionhearts and other wonderful books. Preserving and sharing Ilon Wikland’s heritage is very important for both Haapsalu and Estonia. This is something that is not found anywhere else in the world. Ilon’s Wonderland is unique not only for playfulness and cosiness, but also by telling Ilon’s story in the environment where she has come from. Ilon’s complicated biography from a war refugee to a world-famous artist touches the soul of many people. Obviously, this is a recipe for a good exhibition/museum – an emotional story, successful implementation and soulful rendering. 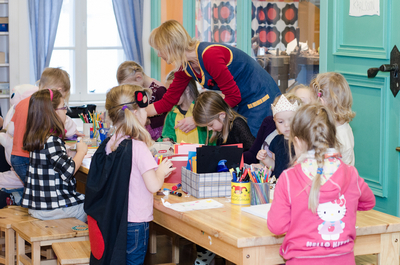 Museum pedagogues organize museum lessons for groups and guide children in handicraft activities. Families with children can take time off and enjoy playing together. Senior visitors can watch a documentary about Ilon and enjoy the exhibition full of memories. Ilon`s Wonderland takes one back to childhood regardless of age. Establishing the new exposition was preceded by several years of preparation. Ilon Wikland placed her full trust in the decorator Tea Tammelaan. Two artists are sometimes able to instinctively understand each other and know how important it is for an artist to have his or her works properly exhibited. That is why Tea Tammelaan also played the role of a curator for this exposition. The main benchmark of the new permanent exhibition is the fact that the museum introduces the life and creation of an alive and still actively creating artist. On one hand this is easier, curator can always ask, „What do you think Ilon, if we will do this or that...?” On the other hand, this is complicated to anticipate, what she may propose and what not.... At this point, it has been essential, how and to which extent Ilon Wikland allows to exhibit her life and creation. The curator-designer’s greatest interest was to display the artist and her creative process, in addition to her rich creation. To show the visitor, how Ilon Wikland’s picture books are born, which is the artist’s workroom, which tools she uses, her personal belongings and tools, as well as preparatory sketches of a recently published book right from her desk have been exhibited. Specially for the exhibition, Ilon Wikland was photographed in her atelier and the photo is displayed life-size together with a copy of her worktable, as if the visitor could be Ilon’s guest in her atelier. Preparations for the exhibition were made in close contact with Ilon Wikland and her opinions on quite many items were decisive. Altogether the cooperation was very smooth and Ilon showed extreme tolerance and trust in us. Aim was to simultaneously exhibit as many works in the museum’s collection as possible and at the same time to create the possibility to exchange the works in the exposition so that in a couple of years all works in the museum’s collection could be exhibited at least once. Withdrawable showcases provide ample extra space for that. Ilon’s Wonderland is a unique theme centre and museum devoted to a living artist, who attends the most important events, if possible. The artist’s story about getting into a foreign country and returning to the childhood’s land as a world-famous artist is rather special. Just as special is coming true of her big dream that her original drawings would be exposed to people is that she would be able to found Ilon Wikland’s Young Artist Prize, which would support and encourage young people with artistic talents. Ilon Wikland’s work has been displayed in several different ways in the exposition: beautifully framed or carelessly marked, as original drawings used to be returned by publishing houses decades ago; as preparatory sketches or layouts, as miniature plastic art pieces and printed in various styles in the books, on postcards and on commodities, printed on various interior design details, such as curtains, ceramic wall tiles and cups. The exposition provides interesting discoveries for children, adults and art professionals. The most important thing is the artist’s own cooperation and presence, which is also acknowledged by the title of the exhibition „I am always here. Ilon”. The exhibition was prepared by a team of very dedicated and experienced professionals. Ilon Wikland herself is unquestionably a professional. The texts were written by Krista Kumberg, a well-known specialist of children’s literature. The author of the graphic design was Katrin Kaev. The general designer Tea Tammelaan have been active in designing museums and exhibitions much more than twenty years. Great help was offered by Tiina Tammer as a publisher and a close friend of Ilon’s. There were the best advisors in technical and administrative fields. All the work has been done in cooperation with the really dedicated team of Ilon’s Wonderland. Working together with such a fantastic artist and personality could be inspiring for everyone. The best advice is to see and discover besides the creation that has become famous also the person behind the creation, the creator in the broadest sense of the world. This has been a unique experience, very instructive and pithy.